Applications are Invited from students belonging to Minority Communities who are pursuing B.Ed. & D.Ed. Courses for Special Incentive Scheme. Special Incentive Amount of Rs 25,000/-P.A will be provided for each year (Maximum for 2 Years only) during the Course Period. 1) Students should be a domicile of state of Karnataka. (Non Karnataka Minority students are not eligible even though they are pursuing higher education in Institutes located within Karnataka. However Karnataka domiciled Minority Students pursuing higher education in any of the Institutions Accredited by National Council for Teacher Education and Department of State Educational Research and Training (DSERT-Karnataka), located anywhere are eligible). 2) Student should belong to Minority Community. 3) Students Annual Family Income Should not exceed Rs.6 Lakh. 4) Student should have scored Minimum 50% of marks in previous examinations to avail the incentive. 5) Students must have cleared all previous examination without any backlogs & are selected based on merit i.e, marks scored in previous exams. 6) Only those students whose B.Ed. & D.Ed. Courses are Accredited from National Council for teacher Education & Department of State Educational Research and Training Respectively are eligible. Step 1 : Go to the official website of Directorate of Minorities provided above. Step 4 : Next fill the remaining details to complete the registration form. Step 5 : After successful online registration the candidates must take the print out of Duly filled in ONLINE APPLICATION FORM which is mailed to your provided E-mail id & submit it along with the required documents at the office of the District Minority Welfare Department of the concerned district (where college is located). ** Based on duration of course period each year (Maximum for 2 Years) amount will be sanctioned. ** Students who are availing this incentive are also eligible to apply for National or any other scholarships and are also eligible to avail Government/Departmental free hostel facilities as per the terms & Conditions set by the department. ** Students should submit all the official documents related to admission for the B.Ed. & D.Ed. Course & fee paid Receipts of the college. ** Students should submit separate application form for every year (Maximum for 2 years) to avail the incentive amount of each year separately. ** 50% of the applicants for this scheme are reserved for girls & 25% for D.Ed Course and 75% for B.Ed. Course students. ** If any of the information or documents/income & caste certificate submitted by the students are found to be false at any stage then the strict action shall be taken against the applicant. Last date to apply is 15.12.2018. For further details contact concerned District Officer, Minority Welfare Department. I have selected for Special Incentive Scholarship from Belgavi district but still the amount is not credited. I want to know when it will be credited to Belgavi district? I am a student from Dharwad. I have submitted all documents but still scholarship is not deposited. Where to get information? I would like to apply for special incentive but last date is over because now only I got the information about incentives. Please inform, if there is extension of date for applying incentives. I just completed my B.Ed course this year. Please inform me, If there is any Prize Money Scholarship. 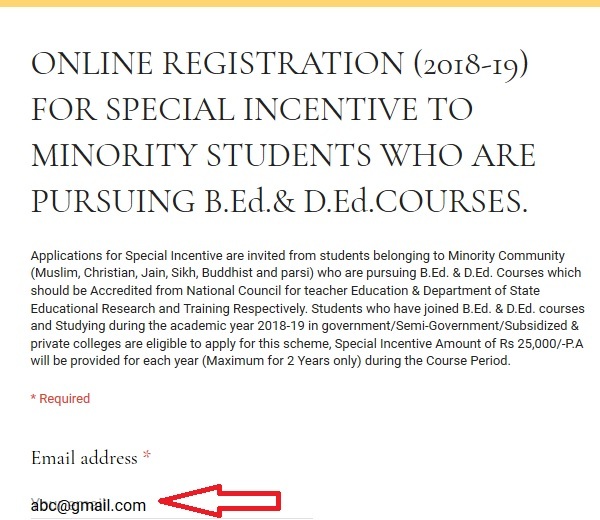 Please someone tell me the last date of minority scholarship. I just completed my B.Ed course this year. Please inform me, if there is any prize money (or) Prathiba Puraskara Scholarship for minority. Kindly clarify that, what can we do if we need to correct any particular information after final submission of the form. It contains instructions, should we take the printout of the whole page? My college is in Udupi district. Can I submit my registration form in Udupi district minority office? I did not get any separate attachment in my mail ID. Please any one suggest me. The page is not opening then how can we upload all the details. We are able to open the page. Check now. Please intimate me, If there is any scholarship for general category low income students who is pursuing B.Ed courses. There is a spelling mistake in bank name. How to correct it? Please answer for this. Tell me, when should I select other option at the stage of filling degree marks? I am studying B.Ed 2nd year, Am I eligible for this scholarship? I don’t know where to submit the documents. Please assist me. Submit to the district minority office where the college is located. I am a student of 2nd semester, college started on March 2018 but we considered 2017-19 batch. Can we apply for this scholarship? I would like to apply for special incentive. I am really exciting of this but I didn’t get these scholarships, I scored 71.26 ℅ in B.Sc and joined in B.Ed course in MM college of education in Davangere this year. Principal of this college didn’t sign in any documents of my Minority scholarship, Vidyasiri scholarship, and this was also gone, please give me a solution for this, please help me. These scholarships are essential for my further studies.